While it is easy to think that dogs can naturally jump from high places like the back of your pickup truck or SUV without necessarily hurting or injuring itself, there’s just no way of really telling that such an activity, especially if done repetitively, will not negative impact the health of your dog’s joints. As such many veterinarians and dog experts actually recommend the use of dog ramps especially if your pooch happens to be overweight or obese, is suffering from an illness especially in and around the joints, or is already in its golden years. And for this, we are sharing with you the results of our exhaustive research into the best dog ramps in the market to help your pooch. If you don’t like the idea of having to fold a platform every time you need to facilitate the going up and down of your dog to and from an elevated position, then perhaps Solvit’s PetSafe Deluxe Telescoping Pet Ramp is for you. This dog ramp for SUV is also perfect for beds, a flight of stairs, and even a truck since it comes with the longest walking platform you will ever find in the market. At 87 inches long when fully extended, the PetSafe is actually more than 15 inches longer than most other platforms. Moreover, it is also about 4 inches wider than conventional dog ramps at 20 inches. The matting on the walking surface is especially built with superior grip technology so your pooch won’t lose grip while walking up and down the ramp. It is quite easy to feel apprehensive that a ramp this large will naturally be heavy. But at only 18 pounds, it sure is lightweight. Not only that, the overall construction helps ensure that it can accommodate even the most hulking of your 4-legged companion tipping in at not more than 300 pounds. It is but natural to expect that the PetSafe will be priced handsomely, but if you look beyond the price tag, then this one’s the best one for your pooch. It looks more like a fully carpeted inclined platform than it is a dog ramp for car. The Pet Gear Tri-Fold Pet Ramp is just like any other standard inclined walking platform for your pooch and other pets complete with rubber grippers on both ends of the platform to keep it steady and stable. It is 16 inches shorter and 4 inches narrower than the PetSafe yet it comes in at 15 pounds, 3 pounds lighter than PetSafe. We would have actually liked it if the unit came in under 10 pounds since we don’t want to be carrying such a heavy doggie equipment around. The good news is that it comes with a molded handle to facilitate the ease of carriage of this folding dog ramp. We strongly suggest getting the black and yellow variant with reflective strips as it can help improve visibility when loading or unloading your pooch in low light conditions. Good thing the Pet Gear comes in at friendlier price, otherwise we really cannot find the appropriate justification for its use. Weighing only 1.6 pounds, the OxGord Paws & Pals Tri-Fold Auto Dog Ramp is perhaps one of the most ingenious doggie loading and unloading platforms we’ve ever seen. You have all the right to think that its construction will be exceptionally flimsy owing to its light weight nature. But, lo and behold, it is as durable as any other dog ramp in the market today. The only downside is that its ramp length is rather short at 5 feet making it a great dog ramp for bed or even your sofa or couch or any other structure that is relatively low. The weight capacity of the Paws & Pals is also lower by 50 pounds compared to the standard in the market. Nevertheless, if you don’t own a real heavyweight of a pooch, then this one’s for you. The platform comes with grooves to allow for a non-slip surface, although personally, we believe the surface can still be quite slippery especially if it’s moist or wet. It comes with lockable latch to keep the Paws & Pals securely folded while on the move or during storage. 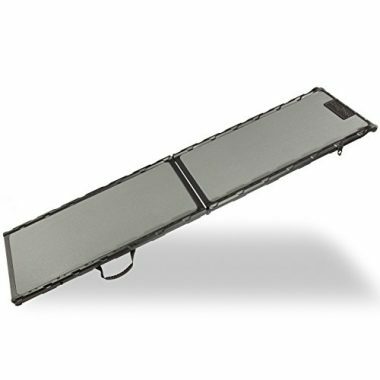 Pet Gear is a folding dog ramp that is available in either a bi-fold or tri-fold configuration complete with a choice between a short 42 inch ramp, a moderate 66 inch incline, and a 71 inch platform. Depending on the variant that you choose, you can get a standard dog ramp for bed with a width of 16 inches or something that is wider at 19.5 inches. 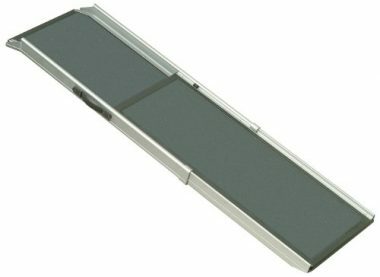 The Travel Lite Ramp features a unique traction technology on its walking surface. 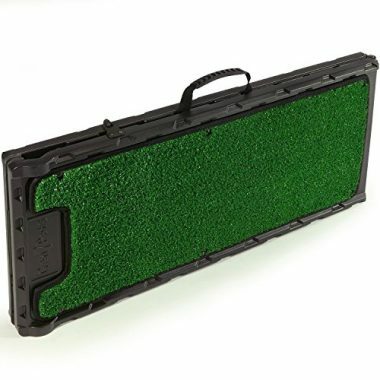 As your pooch walks on the green turf, pressure makes the individual fibers of the SupertraX to cling onto the paw pads of your dog for a more secure footing. The SupertraX matting is also removable so you can easily clean it if you wish. So if you do get the extra-wide tri-fold Travel Lite dog ramp for truck then you can be sure that your pooch will have a much safer entry and exit onto your truck bed. 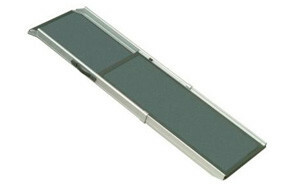 The short ramp can be used on beds and home furniture pieces. While the Travel Lite is not as light as the Paws & Pals, it sure can be quite handy at only 7 pounds yet is sturdy enough to hold a pooch that weighs up to 200 pounds. The Travel Lite looks really amazing, too. If you can forgive the slightly heavy weight of the Gen7Pets’ Natural Step Ramp for Pets, you will love the comfort it brings to your pet’s paws. The walking surface has been embedded with a unique Poly-Grass technology that gives it a softer yet non-slip surface to walk on. 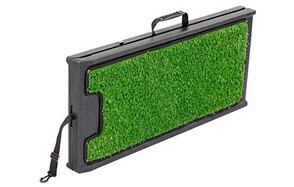 The texture of the artificial grass won’t hurt or scratch the pads of your pet’s paws. More importantly, it won’t scratch your vehicle’s interior, too. It is easily folded in two and secured in place by a locking latch. 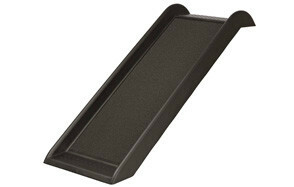 When compared to other products, the Gen7Pets Natural Step Ramp is a bit longer by an inch at 72 inches. We’re not sure if this justifies the hefty price tag that is second only to the PetSafe in this list. Perhaps it’s the integration of the Poly-Grass that makes it quite costly. If you happen to have smaller breeds of dogs in your household, then the TRIXIE Pet Safety Pet Ramp should be a worthy choice especially if you are only going to use it on low-height furniture or platforms. It can also be used on cars, helping your little hound get on and off quite easily. It is a little bit tricky since any platform higher than 10 inches will already give you a slope grade of more than 25%. One should keep in mind that the TRIXIE is only about 39 inches long which should be sufficient for lower-height platforms. Propping it on a 5-inch high platform will give you a gentle sloping grade of 12.8%. Pet experts recommend the maximum dog ramp slope to be anywhere between 18 and 25 percent. One thing to keep in mind is that the lower the slope grade, the easier it is for your pet to climb along. A slope grade of less than 15% is perfect for hounds that have joint or musculoskeletal problems. It is for this reason that we strongly believe the TRIXIE is more geared for smaller pet dogs, although its weight capacity can actually accommodate larger breeds of dogs. Moreover, it is best used on dogs that are otherwise healthy, without any musculoskeletal problems. Its construction is quite commendable, however. Some dogs are more confident climbing on stairs since the structure has several runs that they can rest their paws on and feel more secure while going up to or down from an elevated platform. A very steep doggie ramp can put a strain on the ankles since the feet will be inclined at an angle relative to the surface of the platform. The run of a stair will still be parallel to the surface of the floor allowing dogs to make no changes at all in the angle of their ankle joints. This is where Snagle Paw’s design can be very useful. The Snagle Paw is actually a combination of a ramp and a folding pet stair. It comes with an accordion-type of metal frame with each joint securely locked to prevent slippage of the crisscrossing bars. When used as a pet stair, Snagle Paw can be configured at a high angle or low angle depending on the needs of your pet. Pets with limited mobility should fare better with a low angle configuration, allowing the rise of the steps to be lowered to just 5.2 inches while also increasing the length of the Snagle Paw to about 60 inches. For pets without any problems in mobility or when they need to climb up a much higher platform, then the Snagle Paw’s high angle configuration will come in handy. This actually increases the height of the rise to 6.5 inches, allowing the overall length of the pet stairs to be contracted to only 40 inches. Regardless of the configuration, you can expect its construction to be robust capable of handling even a giant breed of dog that weighs 150 pounds. The width of the steps are also quite wide enough at 16 inches so your pet should do just fine. There’s an integrated tether on one end so you can secure it to your tailgate latch. 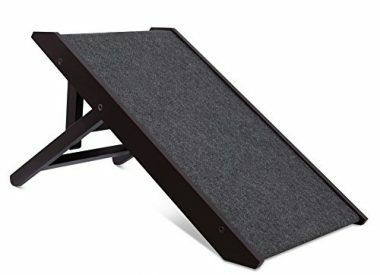 While the Internet’s Best Adjustable Pet Ramp comes in 3 adjustable heights maxing out at 16 inches, most pet parents would agree that it is not really recommended since putting it at 16 inches will give you a slope grade of about 57%. Even its lowest adjustable height of 10 inches will still give you a 35.7% grade slope. As such, we believe that the Internet’s Best should only be used for pets that do not have serious mobility problems or don’t have issues keeping their balance while climbing up or down the ramp. When it comes to sturdiness, however, the Internet’s Best is quite remarkable. The walking surface is covered in a carpet-like material allowing for easier movement along its 28-inch length. What many pet parents like about the Internet’s Best is its elegant design and finish that should do well to provide an additional aesthetic element to one’s home. It can be easily placed beside a sofa or couch or even as access for your pet into your car. It’s lightweight yet strong, capable of holding a 175-pound pet. The Internet’s Best is a great choice if you have a need for sturdier, more furniture-looking contraption for your low-height platforms. One thing that’s great about the Titan Ramps is that the walking surface actually consists of small rectangular ridges that are far superior in providing a non-slip surface than conventional carpeted or textured platforms. 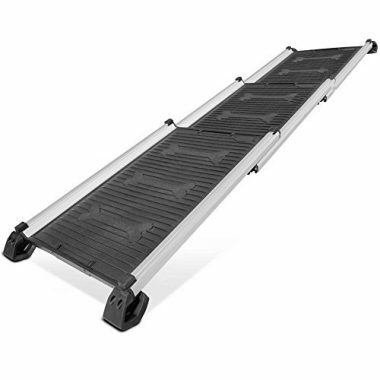 This helps ensure your pet won’t be sliding along the entire 61-inch length of the ramp. 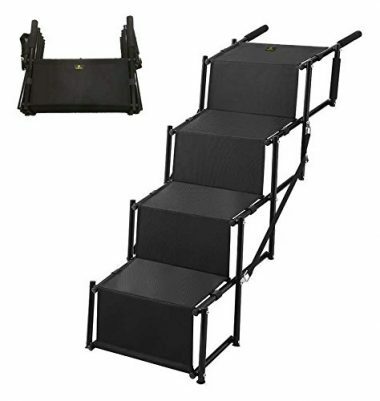 Another very useful feature is that, unlike folding systems, the Titan Ramps come with an ingenious sliding or telescoping mechanism, allowing the three panels to slide on top of each other creating an 4.5-inch thick, 28-inch long, and 16.75-inch wide system that is very easy to store or slide under your bed or even sofa as long as it has at least 5 inches of ground clearance. You can even store it in your closet, under your kitchen sink, or virtually anywhere else. Guide rails make climbing onto platforms a lot safer for your pet, too. Its rigid plastic construction is further strengthened by the use of durable aluminum frame, preserving its lightweight characteristics for easier management. 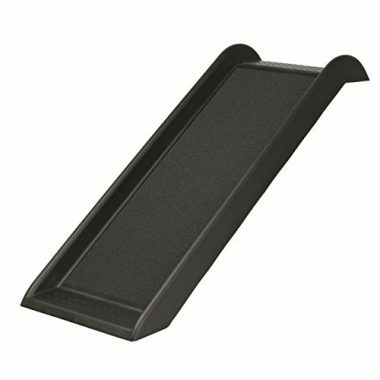 The extra-large non-slip rubber feet are also noteworthy, unlike other systems that have very small non-slip surface securely anchoring the pet ramp onto almost any surface. The Titan Ramps is a great choice for those who don’t have the luxury of space, who require a sturdier platform, and for those who prefer a sliding mechanism over a folding one. 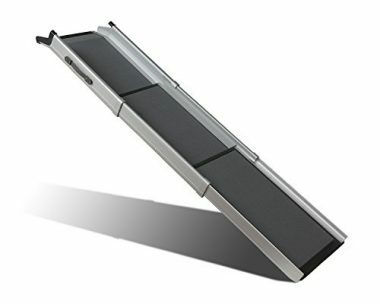 If you love the Titan Ramps but don’t like its design you should try Solvit’s Deluxe Tri-Scope. It essentially has the same mechanism: a 3-panel sliding mechanism that glides two panels over the base panel to produce a 5-inch thick contraption. It’s a lot sturdier, too, fully capable of taking in the weight of almost double the weight capacity of the Titan at 300 pounds. On that note some pet parents can actually think of many potential uses of the Deluxe Tri-Scope other than loading and unloading your pet. And while it is easy to think that the Solvit is going to be very heavy, it’s actually fairly light at just 14 pounds. One thing we did notice about the Deluxe Tri-Scope is the way in which the overall system has been designed. Compared to the Titan, it looks more elegant, more refined, and definitely classier. The guide rails are a bit higher, too, allowing for safer and more secure passage for your hound. The ramp itself is longer by 11 inches extending it up to 70 inches. This means you can safely put it on an 18-inch high platform and your hound will still be able to safely walk on a 25.7% grade. Of course, you can always choose to use it on even higher platforms provided you hound doesn’t have any issues that may make walking on a steep grade especially risky. The walking surface doesn’t come with ridges. Instead, Solvit used the same material found on the decks of skateboards as well as truck beds to give your pet firm footing while eliminating slippage. It is a bit pricey, though. But considering the way in which it is designed and constructed, it still provides exceptional value. Gen7Pets calls its pet ramp the Feather Liter. Sadly, at 17 pounds, we’ve seen many pet ramps that are even lighter with some in the low single digits. One thing Gen7Pets gets right, though, is the robustness of its construction. The frame and walking surface are constructed of only the sturdiest materials. The frame comes with an integrated soft rubber handle to make it super-easy to carry around. The length of the ramp is also longer by 2 inches than the Solvit Deluxe Tri-Scope, although it will still occupy more space once fully folded. It’s strong enough to handle a 250-pound dog which makes it quite a tool for other purposes. One very interesting thing about the Gen7Pets is its walking surface. We’re not sure about the accuracy of the description as it says ‘sand paper material’. It would be quite odd if actual sand paper was used in the construction of the walking path. Maybe it’s a lot similar to a coarse layer of material that is found in skateboard decks. Regardless, the surface provides a secure platform with which your pet can use to climb onto a higher structure. Unfortunately, some pets don’t like the feel of it. For its price, the Gen7Pets is a great alternative to more expensive contraptions. It is sturdy and lengthy, too. Kurgo’s Wander Collapsible Dog Ramp is described as a low-stress ramp, allowing pets as heavy as 200 pounds to safely navigate its 62-inch long and 15.5-inch wide walking surface. The guide rails are higher than most of the other ramps that we’ve seen so far. There are also ridges underneath the ramp serving as possible anchor points for the doggie ramp, supporting its rubberized feet. One thing we noticed about the Wander is that it isn’t really straight when fully extended. Instead, it somehow follows the shape of a slide: gently sloping at the top before making a steep dive towards the bottom. When looked from afar, it does look straight, though. There are some issues about the construction of its walking surface. Some pet parents say it feels gritty like that of sand paper that their pets simply refused to walk on it. The published weight capacity at 200 pounds is also somewhat dubious since there are concerns about it being unable to handle a 150-lb dog. The construction also looks relatively cheap that many feels it doesn’t justify its more than a hundred dollar price tag. There are, nevertheless, pet parents who are quite happy with their purchase. Regardless of how nimble you think your dog is, at some point in its life it will need assistive devices and gadgets to help in its movement. This is why it is imperative that we all learn how to pick the right dog ramp to buy for our respective pooches. This buying guide is intended to help you navigate the otherwise complicated process of doggie ramp selection. 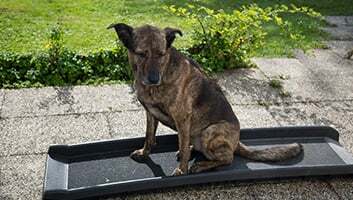 A dog ramp is considered an assistive device that help facilitate the safer movement of a dog to and from an elevated position such as the back of an SUV, the flat bed of a pickup truck, and home furniture like beds, couches, sofas, and even stairs. The point is that, just like any simple machine, the doggie ramp helps reduce the amount of work that dogs have to perform to accomplish the task of getting from Point A to Point B. In many instances, these contraptions are indicated among dogs that have joint issues such as canine arthritis, osteoarthritis, hip dysplasia, and even severely weakened musculoskeletal system. Jumping on or off an elevated platform can create undue pressure on the joints which can further increase the likelihood of articular and cartilage damage. This can further aggravate the joint abnormality in dogs. Dog ramps are not only indicated in pooches with musculoskeletal and articular problems. These are also recommended for use among dogs that are sick or ill. When pooches are down with an illness, their energy levels drop significantly that many don’t feel like moving at all. Getting up and onto your vehicle can be very taxing for a sick pooch. As such, allowing them to walk at an incline greatly reduces the amount of work they have to perform and this helps them conserve their energies, allowing them to heal a lot faster. Doggie ramps are useful, too, among senior pooches and puppies. Senior dogs typically present with a lot of health problems from diminished muscle strength, stability issues, chronic pain, reduced range of motion of the joints, and even bone fragility. The latter is a special concern since one wrong landing from an elevated position might break the already-fragile bones of senior dogs. Likewise, puppies don’t have the necessary muscle strength yet to jump onto your truck or your car or even onto your bed. They require assistance in getting onto these things. For some folks doggie ramps are nothing more than a useless way to spend money. But if we truly understand the need for such a device, we would really be looking for the best inclined walking platform for our pooches. Choosing the right ramp for your pooch is relatively easy. This is especially true if you already know what factors you have to consider when picking the right one. And in case you are not yet fully aware of what to look for, we’ve enumerated them for you. If you’re thinking that there is only one design or style of pet ramp because of what we have listed herein, you’d be surprised to know that there are different types of ramps often based on their purpose. There are those that are purposely made for home furniture pieces such as beds, couches, sofas, and even tables. There are also those that are purposely designed for several flights of stairs which should be more like the ramp that is dedicated to wheelchair-bound individuals. Then of course, there are those platforms that are designed specifically for vehicles. Dog ramps come in various styles, too. There are those that look more like elaborate stairs complete with railings and soft, padded steps. Then there are those that look more like your traditional straight ramp. Whatever the case, just make sure that you know what you’re looking for. The trick is to pick one that you can use both in the home, in your vehicle, and anywhere else in between. Folding and telescopic types of inclined walking platforms offer exceptional versatility in that they can be easily stored and transported wherever they are needed. Personally, we recommend the telescopic variety since it is a lot easier to extend the length of the walking surface simply by sliding one panel over the other. This eliminates the tendency of flipping and folding panels that you are at an increased risk of hitting yourself or even your vehicle. Besides, there really is greater amount of work that is needed in a folding mechanism. The downside to it is that a telescopic system is usually more expensive. Fixed ramps are great options for beds and other low-height furniture. However, since they are fixed, you’re essentially wasting precious space. So, if you live in a rather tight living accommodation, a folding or telescopic system is still best. But if you live in a home that simply has overabundance of space, by all means indulge in the grandest fixed doggie ramp you can ever get. From what we have presented to you, the lightest came in at about 1.6 pounds while the heaviest is around 18 pounds. 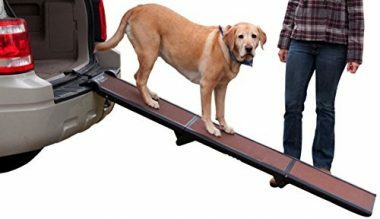 The weight of the ramp really matters since you also don’t want to strain yourself loading and unloading this contraption onto and from your vehicle, fixing it up for your dog to walk on, and store in the correct place afterwards. The point is that these should be easy to handle. The weight of the ramp can affect quite a number of parameters on the contraption. For example, inclined platforms that are unusually heavy allow for strength, stability, and sturdiness while those that are light often are made of flimsier materials, but not everything, of course. As such, it is important to strike a balance between portability and structural durability and strength. We did mention that the ramp’s structural soundness can be translated into its weight. Heavier ramps typically have more solid construction. However, just because a particular unit is lightweight doesn’t automatically mean that it is already structurally unsound. Wood and steel typically provide the best when it comes to durability and strength. Unfortunately, wood is pricey and subject to effects of weather. Metal or steel can be very heavy, although aluminum can make it light. Vinyl products are lightweight and durable, too. However, you still have to check the patency of the joints especially in folding or telescopic variants as the point where two panels meet is often the area of least strength. Regardless, a good measure of a doggie ramp’s sturdiness is its maximum weight rating. In our list, we’ve listed products with maximum weight capacities ranging from as low as 150 pounds to as much as twice that. But, don’t blindly follow this guideline as manufacturers are known to bloat their weight ratings to boost sales. At the very least, lower your expectations by about a quarter. So, if the product’s rating says it can handle 200 pounds, then you’re potentially looking at a 150-pound limit at best. It’s better to play it safe. Stability is one feature that you have to look for in the right doggie ramp. The more stable the platform the safer it is for your pet. This means you have to look for minute features that can afford your dog stability while moving up and down the ramp. Look for stabilizers at both ends of the ramp, one on the top platform and another at the bottom. 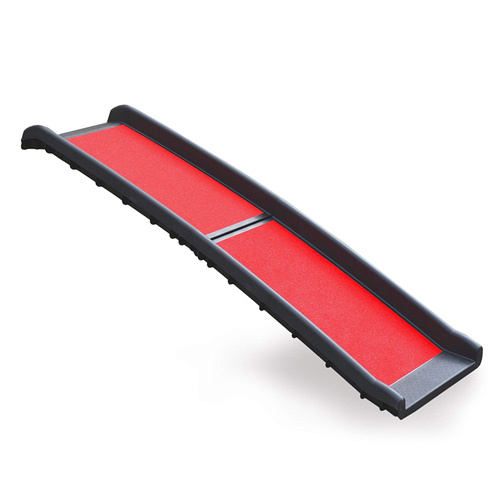 Typically, these are made of rubber grip materials as these tend to provide exceptional antislip properties. There are also those that may come with secure latches which you can attach onto a component of your vehicle to keep it from moving in its place. If the dog ramp is a folding type, then you have to check the security of the lock mechanism so that it stays unfolded and in place. If it is telescopic, then look for similar mechanisms that will lock the sliding panel into place. Other safety features you might want to consider when picking the right doggie ramp include side railings or guard rails as well as reflective strips. As for the latter, this might come in handy in low visibility conditions so your pooch knows where it is stepping on. If you have ever tried moving up or down a ramp yourself, chances are you may have felt like you’re losing grip on your feet. Because the surface upon which our feet are planted is not parallel to the ground but rather at an angle, gravity pulls us towards one side, compromising our stability. If there is no traction under our feet, then the likelihood of falls is increased. The same is true with dogs. As they climb up or down an incline, their paws must ‘feel’ secure on the solid and firm surface. It should also have some texture to allow for the minute grooves under the paw pads of our pets to grab onto. That is why traction is a very important consideration. The length of the ramp can have two very important implications. First, it can have a bearing on the incline of the ramp, hence the overall safety of your dog while it is climbing up or down the ramp. A longer ramp in the 60- to 70- inch range or perhaps even longer should help provide for a gentler slope or incline. Ideally, the incline should be no more than 25% as anything greater will be more for climbing purposes already. A steep incline is not really suitable for dogs with joint problems or sickly dogs as they will need more effort to walk the steep incline. The length of the ramp can play a major role in such a situation. For example, if you have an elevated platform of 20 inches and you have a ramp length of 70 inches, this translates to about 28.5% slope. However, if the length of the ramp is only 60 inches, the slope or incline gets steeper at 33.3%. For dogs that are healthy and agile, this may not be a problem at all. But if your dog happens to have arthritis, is already very old, or is very weak because of an illness, then the 33.3% slope is too steep for it. It may not have the strength to go up the platform. You can remedy this, of course, by lowering the height of the elevation. But what if it is already at a fixed height, then you’ve got a problem. Secondly, the length of the ramp will affect the amount of space that you have at home. If the ramp is for indoor use, you should consider readily available space on the landing floor. It should be able to accommodate the entire length of the ramp with plenty of room to spare. If space is not really something that is available, then maybe a shorter dog ramp might be better. But then again you’d have to check its resulting incline. We mentioned above that one of the things you might want to consider when picking the right dog ramp is portability or its ease of handling. There are many reasons or benefits why you should always go for something lightweight and easy to handle compared to one that is fixed, bulky, and exceptionally heavy. Here are some of the more common benefits of buying a portable dog ramp. A portable doggie ramp is typically lightweight and can come in modifiable designs such as telescopic and folding. What this essentially translates to is that it affords you greater flexibility in its use. 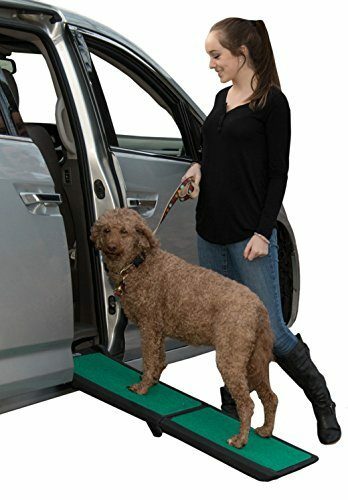 If you intend to use it as a dog ramp for bed or even a dog ramp for car, then all you need is to keep it in its folded form so that the length of the ramp is shorter and allows for greater movement for your pet. If you have a higher elevated platform such as the flatbed on your pickup or even your bed, then you can simply unfold it or extend its telescoping panel and you’ve got a nifty dog ramp for SUV or dog ramp for truck. And if you have a doggie ramp that has a weight capacity of more than 200 pounds and a wide ramp, then you can also use this for other purposes. The possibilities are simply endless. Portability means ease of handling and transportation. You can easily stow this inside your car’s trunk, at the back of your SUV, or even the flatbed of your truck. Since it is generally lightweight then handling it, maintaining and cleaning it, and transporting it becomes a very easy chore. Folding portable dog ramps and even telescopic units allow you to store them even in the most unlikely of places. For example, you can easily slide them under your bed or have them standing behind your door. Any unused space can be utilized as a storage compartment for your doggie ramp. If it is very lightweight, you can even mount it on the wall or create a hanger on your ceiling to really maximize space. Since portable telescopic and folding dog ramp units typically weigh less than 20 pounds, you no longer have to strain your back picking them up, unfolding or extending them to full use. This helps minimize the risk of back injuries. A dog ramp should also be safe as it is effective in assisting our pets ambulate from an elevated position. This means we have to adhere to the following safety tips when using a dog ramp. This is one of the best ways to ensure safety while using any doggie contraption. If your pooch is not properly trained to walk up and down the ramp, then the risk of falls and injuries increases substantially. That being said, you may want to devote a good amount of time to training your dog how to use the ramp and feel more confident going up and down on it. While ramps have features that allow them to be placed firmly on the ground you should still make sure that the ground upon which one end of the ramp is planted on is level and firm. This helps minimize movement of the ramp and helps improve the safety features that are embedded with the doggie ramp. Your pooch, especially if still untrained, will always have the tendency to jump off from the elevated platform instead of walking up or down the ramp. That is why training is important. Equally important is your supervision so your dog knows that you will always be there to support it and guide it through the process of mobilizing up and down the inclined pathway. Of course, we wouldn’t be having this buying guide if you don’t choose the correct doggie ramp. Make sure that you understood the things you need to look for in a dog ramp so that you’ll have a much better chance at ensuring greater safety for your pooch. Dog ramps are important assistive devices for sick, elderly, young and juvenile, and arthritic dogs. These come in various shapes, styles, and designs. However, at the end of the day, stability, safety, and ease of use should still be three of your primary concerns in the selection of the best ramp for your pooch. You May Also Like Our Review of the Best Dog Boat Ramps. Q: What’s the difference between dog ramps and dog stairs? A: Dog ramps and dog stairs are two of the most common mechanisms that can help certain dogs get on and off an elevated structure such as the couch, bed, car, truck flatbed, and other similar surfaces. Both are ideal for helping hounds that may have issues moving onto or off the elevated platform such as older or senior dogs and hounds with arthritis. Small breeds of dogs can also benefit from either platform. This goes without saying that puppies will benefit as well. Even dogs that are recuperating from surgery or from an illness can benefit from either a dog ramp or a dog stair. But when should you choose one or the other? The main difference between a dog ramp and a dog stair is the presence of steps in the latter. Imagine drawing a straight line starting from the edge of an elevated platform and terminating on the ground some distance away. This forms a slope that can either be gentle or steep. As such a dog ramp will be defined by its length as this will easily translate into its slope or gradient. When it comes to the slope of the ramp, the height of the elevation and the length of the ramp will determine its slope. Ideally, it should be no more than 25% in grade as anything greater may be too steep for your pet’s comfort. A gently sloping ramp is preferred over a steep one especially if you have a pet dog that has health or musculoskeletal issues. For example, a dog with arthritis will have difficulty moving its joints. If the incline is too steep there is an increased pressure on its joints which can make climbing a lot more difficult. This is because its joints at the ankles will be in a hyperflexed position to maintain the body’s parallel position relative to the surface of the ground. This is to help maintain balance. If the incline is small or gentle there is little pressure on the joints and the ankles will not have to flex so much so as to create pain. Thus, a dog ramp is ideal for dogs that have difficulty moving their joints or may have reduced sense of balance since they can easily glide their feet along the flat surface yet inclined of the ramp. On the other hand, a dog stair will be a lot similar to the stairs that you’re pretty familiar with. It has runs and rises with each step. The beauty of such a mechanism is that it usually requires a smaller space since an elevation is provided after each run. It’s perfect for pets that have no issues maintaining balance as they go up and down the stairs. It can also be used on pets with limited mobility, but this largely depends on the height of the rise. If it is too high it may be a bit difficult for them to maneuver their limbs onto the next run. As such, dog stairs are great options for hounds that are agile and mobile enough to run up and down a standard flight of stairs. Q: What size of dog ramp will I need for my pet? A: The size of the dog ramp actually depends on a number of factors. First you’ll have to consider the height of the platform or structure that you’re going to set it on. For instance, if you intend to use it for your pet to access your couch, then you’d have to consider the height of the seat of the couch. If it is about 15 inches off the floor the next thing you’ll consider is the available space upon which you can set up the platform. If you have about 30 inches of space, then you know that you’ll need about 28 inches of ramp length. Unfortunately, this also means that you’ve got a rather steep incline of 53%. The thing to understand in getting the right size of dog ramp is to make sure you have plenty of space which you can set it on. This is to make sure that your dog will have a gently-sloping ramp rather than a steep one which can increase the risk of injuries. This will utterly defeat the purpose of having a dog ramp. So, make sure you take the height of the elevation and the available space around it when considering the size of the dog ramp. As a rule, the longer the ramp the smaller is the angle of the incline and the gentler is the slope. A gentler slope makes it a lot safer and easier for a dog to get onto an elevated platform especially if your dog is sickly, has arthritis, or is already a senior dog. Even puppies and small dog breeds will not have any issues climbing on and off any elevated platform. The downside to a longer dog ramp is, of course, it will eat up plenty of your space. And if space is not really a luxury you can afford inside your home maybe a dog stairs will be a lot better. You may also want to experiment with a shorter dog ramp, although this will make the incline a bit steeper. Perhaps a more important size dimension is the ramp’s width. You will need to check the widest part of your dog and make sure that the ramp walking surface can cover your dog’s body at its widest with ample allowance on both sides. For example, if your pet has a side-to-side width of 12 inches, then a platform with 14 or so inches in width should be sufficient. Q: How do I keep the ramp from slipping on tile or cement surfaces? 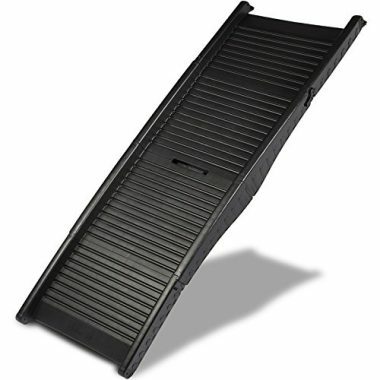 A: Modern dog ramps now come with anti-slip, anti-skid, rubberized feet that should help prevent it from slipping on your floor or any other surface. Unfortunately, there will always be instances when the floor is way too slippery that even rubberized feet can no longer offer peace of mind. Floor tiles and polished cement surfaces may have a non-porous surface which makes it rather difficult for the rubberized feet to grab on. So what can you do? A search on the internet revealed many fascinating tips. First, you can put an old rag or even an old towel on the floor where the edge of the dog ramp will land on. It may not really keep the dog ramp secure in its place, but it sure can provide additional anchorage. You can even use an area rug or carpet that you are no longer using. The weight of the rug or used carpet should help keep it stay in place. Another interesting solution is to put an adhesive tape or duct tape on the edge of the dog ramp and stick this onto the surface of the floor. This can be a great solution if you are looking at a dog ramp that you will no longer be using anywhere else – it’s going to be a permanent fixture. Otherwise, it would be utterly ridiculous if you have to stick your dog ramp to the floor every time your dog has to use it and then remove it again when it’s done. Also, you might leave adhesive residues on your floor’s surface. If you love your pet so much you might want to consider having a professional apply a special coating onto your floor’s surface to make it less slippery. There are a variety of floor solutions like epoxy paints and other similar products that can be applied onto floors to improve their skid protection. 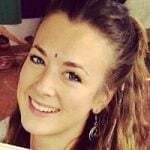 Of course, this will really entail some costs and if you’re not really prepared to go that route yet then this is not a good solution for you. Lastly, you may want to have someone else hold the dog ramp in place while you’re assisting your dog to get on and off the elevated platform. You may also want to put anchoring blocks one both sides of the landing edge of the dog ramp. You can place heavy objects on the opposite sides to help keep the ramp in place. Q: Can I use a dog ramp in a pool? A: Some dog amps can be used in a swimming pool, although it’s not really absolutely necessary. If there is a need for your pet to swim, then maybe buying it a doggie pool is a lot better than having it join you in your pool. However, if you enjoy the company of your dog right in your swimming pool, then by all means you can use a dog ramp. In such cases you will need a dog ramp that doesn’t contain metal as you’re risking corrosion which can limit its other uses. You will most likely have a better chance at a dog ramp that is made entirely of durable, heavy-duty plastic. That being said, you might want to consider getting a dog ramp that is especially designed for such a purpose. There are a number of doggie ramps that can be used for water activities such as boating and not just when swimming in a pool. Another issue you will need to address is securing the dog ramp by the edge of the pool. You should have a mechanism that will securely anchor the dog ramp in its place so your dog will not have any problems climbing up the ramp. A longer dog ramp will also be required as you can extend it well into the water allowing your pet to easily get onto it.